Over the years, Donovan earned many accolades for his work in the fire service. He was always a strong supporter in the fight against cancer and participated many times in the Scott Firefighter Stair Climb in honor of his father. He was most recognized for his pure heart, willingness to help those in need, and putting others first. 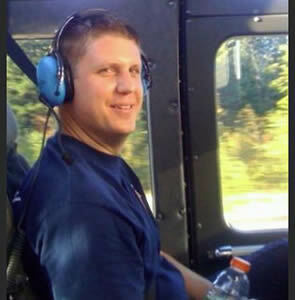 Tall and broad shouldered, he was truly a gentle giant and set the standard as a "Fireman's Firefighter." For Donovan’s full story, click here. 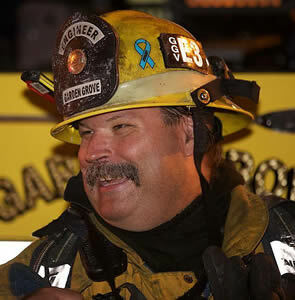 Mike Kreza was an 18 year veteran of Costa Mesa, CA Fire & Rescue. Known as ‘Ironman Mike’ by members of his department, the 44 year old Kreza was training for a triathlon when he was stuck on his bike by a suspected DUI driver. He is survived by his wife and three young daughters. For Mike’s full story, click here. Joe Loveless started as a volunteer firefighter for Roy and Graham Fire when he was 16 years old. 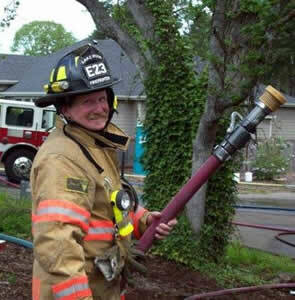 He was hired in Lakewood, WA on March 1 1979 and retired May 31, 2010 with 31 years of service. Joey has been diagnosed with Recurrent Squamish Cell Carcinoma stage 4 throat cancer. Recently, 30 members of Local 1488, West Pierce Professionals Firefighters replaced the entire roof of the Loveless home in a day and a half. Lionhardt was proud to support their tremendous efforts by paying for materials. For Joe’s full story, click here. Captain Yamakawa was recently struck with sudden onset Congestive Heart Failure that nearly cost him his life. 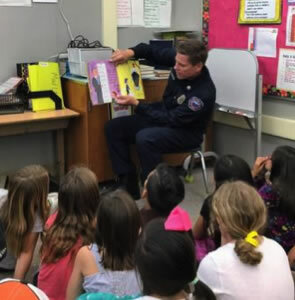 At age 49, Rob will no longer be able to work as a Firefighter in the same capacity, and may require extensive Heart Surgeries and Rehabilitation in the future. Rob and Kristine have two young boys and are in need of our support. Rob is a true servant of others, whether he is coaching youth sports, saving lives on the job, or creating a charitable organization to help others. 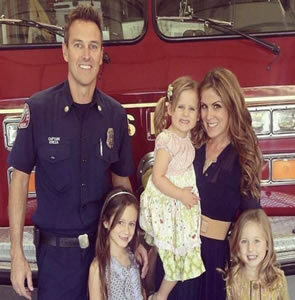 Rob was the driving force and founder of the Anaheim Firefighter Relief Association, which was established to assist our members in their time of need. For Yami’s full story, click here. ALS. Amyotrophic lateral sclerosis, or Lou Gehrig’s disease as it’s often commonly known. With his career cut short by a devastating ALS diagnosis, John Van Mannekes and his family need the community’s help to offset sky-high equipment and caregiving costs. John is no longer able to do the job he loves to do. His family has had to move into a one-level home. The medical bills are multiplying. Caregiving and equipment costs are prohibitively expensive. John has helped countless members of our Ventura City community. Now he and his family need our help so he can access vital care. For John’s full story, click here. During a two hour firefight in 105 degree heat…my life changed with the reading of a heart monitor strip. I found myself in the hands of our own paramedics…going code three to the hospital. My cardiologist’s diagnosis - acute heart failure. My ventricle was only pumping at about 20% when normal ejection fraction is 50-70%. Since then, my family & I have been on a long, uncertain road of medical appointments, medications and adjustments that accompany the recovery process. My time being off has been taxing on the family and finances. I’ve worked with Mr. Gannon Eckhardt in the same department for many years. He witnessed my ordeal from day one and approached me. I knew his brother had passed from cancer, and that Lionhardt.org had been formed. Mr. Eckhardt helped me get through a difficult recovery time, and Lionhardt generously awarded me and my family a donation that helped us financially. After five months of rest and therapy, there has been improvement. I have an optimistic outlook for recovery. And, I am very thankful to Lionhardt for their gracious donation. For Guy’s full story, click here. 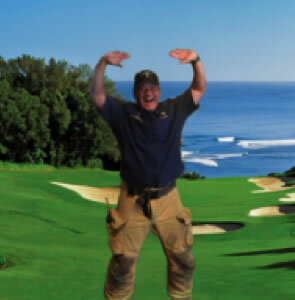 The Huntington Beach Firefighter's Association presents the Great Balls of Fire charity golf tournament. The event will be held on October 8, 2018 at the Seacliff Country Club in Huntington Beach. Lionhardt will be there. Click here for event information. We are a 501(c)(3) organization established in honor of fallen firefighter, our brother Donovan Eckhardt. When a persistent and unapologetic cancer took hold of Donovan, he gave commission to a close group of friends to carry forward his legacy and demonstrate the benevolence of his character to those families that would face similar challenges.